This little painting (12″x9″) was an experiment in painting mist in a scene with deep shadows. Of course I’ve painted mist before, but not with such colour and deep shadows, and now without medium in the paint mix. Looking at this video I’m reminded of this rule for oil painting – darks before lights. It would appear I do not subscribe to this rule as many of the final colours are the darkest in the painting. I have to say, in spite of appearances, I’m a strict follower of the darks before lights principal. If the rule is qualified by a few additions, it does make sense. In traditional landscape painting, perspective is an important issue. If a landscape is painted from the distance towards the viewer, the scene can be broken down into ‘planes’ of similar distance, each one painted systematically. For example, the sky is the most distant ‘plane’. This is painted first. Within this ‘plane’, the darks are painted first. The deep blues, the greys of the clouds and then finally the lightest parts of the sky. The next ‘plane’ are the hills and mountains of the horizon. Here again, the dark colours are placed down before the brighter shades. The point is, within each ‘plane’ the darks are painted first. Sometimes its necessary to remove all the lighter colours, especially those containing white in the mix, from the palette before a new ‘plane’ is started. Even the smallest contamination of white in the shadow colours can completely destroy the richness of the colour. The small palette, with so few colours of my working method make this system easy to control. It would not suit most painters as it is restrictive, lacking the flamboyance of other methods. Here’s the video of the above painting including paint mixing. 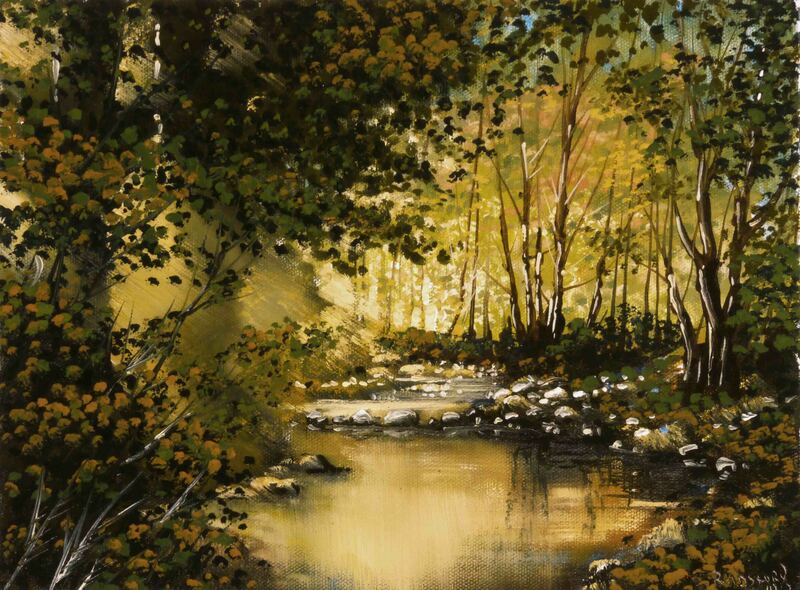 This entry was posted in Oil Painting and tagged Art, arts, autumn, Culture, Education, fall, Inspiration, Irish landscape, Medium, Oil Painting, Oil Painting Instruction, Oil Painting Landscape, painting, painting perspective, Pictures, pond, river, simple, Solvent, Time lapse painting, Trees. Bookmark the permalink. Thank you Kimby. This is the attraction of creating a landscape. We construct a world, the viewer shares with the artist. Portraiture and still life is an observation for the viewer and, for me, lacks the involvement I find in landscape. I half expect to see a deer show up at the far end of the creek to take a drink of water. I really liked how you handled the rays of light pouring through the trees.